MAKATI CITY (3 June) – Immediately after the first round of Pakighinabi (Conversation) Series on the significance of the ‘Amman Message’ in interfaith and intra-faith dialogues (http://www.addu.edu.ph/blog/2015/04/29/the-significance-of-the-amman-message-by-dr-mansoor-limba) at the Ateneo de Davao University, Davao City, on April 22, 2015, and another presentation (The Role of Religious Organizations in the Promotion of Mutual Understanding and Harmony: The Case of ‘Amman Message’) at an international interreligious conference on the approach of Islam and Christianity towards religious extremism and violence (http://www.ust.edu.ph/news/international-conference-on-interreligious-dialogue) held at the University of Santo Tomas, Manila, on April 29-30, 2015, the need for an introductory reading material on the said document was expressed by some attendants to both forums. This primer is a personal response to the said request. Q: What is the ‘Amman Message’? A: The ‘Amman Message’ started as a detailed statement released on the eve of the 27th of Ramadan 1425 AH / 9th November 2004 by H.M. King Abdullah II ibn al-Hussein of the Hashemite Kingdom of Jordan. Q: What does the ‘Amman Message’ significantly contain? A: The ‘Amman Message’ significantly contains three (3) questions posed to 24 of the most senior Muslim scholars from around the world (including Shaykh al-Azhar of Egypt, Ayatullah Sistani of Iran and Shaykh Qaradawi of Qatar): (1) Who is a Muslim? (2) Is it permissible to declare someone an apostate (takfir)? (3) Who has the right to undertake issuing fatwas (legal rulings)? Q: What relevant event happened subsequent to the issuance of the detailed statement? A: In order to cement further the religious-legal authority of the answers to the said three fundamental questions, King Abdullah II convened in July 2005 an international Islamic conference of 200 of the world’s leading Muslim scholars (‘ulama) from 50 countries. Q: What were the points highlighted in the said conference? A: Three (3) points were highlighted in the said conference, namely: (1) Whosoever is an adherent to one of the four Sunni schools (madhahib) of Muslim jurisprudence (Hanafi, Maliki, Shafi‘i, and Hanbali), the two Shi‘ah schools of Muslim jurisprudence (Ja‘fari and Zaydi), the Ibadi school of Muslim jurisprudence and the Thahiri school of Muslim jurisprudence, is a Muslim. (2) There exists more in common between the various schools of Muslim jurisprudence than there is difference between them. (3) Acknowledgement of the schools of Muslim jurisprudence (madhahib) within Islam means adhering to a fundamental methodology in the issuance of fatwas. Q: In short, what is the significance of the ‘Amman Message’ in intra-faith dialogue or the relationship among Muslims? A: The said document is reportedly the largest contemporary ijma (consensus) in the Muslim world. From July 2005 to July 2006, it had already earned 552 endorsements from 84 countries including those of the late King Abdullah al-Saud and 14 other personalities from Saudi Arabia, Al-Azhar University Rector (mufti) Sheikh Tantawi of Egypt, Sheikh Qaradawi of Qatar, Ayatullah Sistani of Iraq, and Imam Khamene’i of the Islamic Republic of Iran. As of June 1, 2015, there are 68,975 online endorsements since March 1, 2007. Q: What are other efforts along this line of the ‘Amman Message’? A: In contemporary time, there have been many intra-faith efforts by Muslim scholars, some of which are the correspondences (al-muraja‘at) between Sheikh Salim Bisri of Al-Azhar University, Egypt, and Sayyid Sharafuddin Musawi of Lebanon; the exchanges between Sheikh Mahmud Shaltut of Al-Azhar University, Egypt, and Sayyid Husayn Burujerdi of Iran; the opening of Dar al-Taqrib bayn al-Madhahib fi’l-Islam (Forum for Proximity of the Schools of Thought in Islam) in Egypt; re-opening of Dar al-Taqrib bayn al-Madhahib fi’l-Islam in Tehran; the declaration of 12th to 17th of the Islamic lunar month of Rabi‘ al-Awwal as International Islamic Unity Week; and the annual International Islamic Unity Conference every month of Rabi‘ al-Awwal, among others. Q: In short, what is the significance of ‘Amman Message’ in interfaith dialogue or the relationship of Muslims with followers of other religions? A: A relevant point highlighted in ‘Amman Message’ is that acknowledgement of the schools of Muslim jurisprudence (madhahib) within Islam means adhering to a fundamental methodology in the issuance of fatwas. In other words, only a high-ranking Muslim scholar worth his title has the authority to issue religious edict, which oftentimes targets the lives of both Muslims and non-Muslims. As such, not any Abu Bakr, ‘Umar, ‘Uthman or ‘Ali is religiously qualified to do so. Q: Given this intra-faith and interfaith significance of the ‘Amman Message,’ how can one endorse the document? A: It is very easy. The endorsement can be done online. Just visit ‘Amman Message’ website at http://www.ammanmessage.com. Q: How long will online endorsement take? A: It will only take one to three minutes to fill up the following information: full name; email (required); country (required); date of birth (required); title; position; organization; whether Muslim or not; whether Muslim scholar (‘alim) or not; and gender. Q: May a non-Muslim endorse the ‘Amman Message’? A: The fact that one of the pieces of information asked in the online endorsement box is whether the endorser is a Muslim or not logically follows that a non-Muslim may endorse the ‘Amman Message’ considering its practical importance and benefits to Muslims and non-Muslims alike. Q: How can one invite a friend to join the online endorsement? A: The website provides a Tell a Friend Script (http://ammanmessage.com/tellafriend/index.php) which will only take a minute to fill up. Q: How many and who are the prominent Muslim entities from the Philippines that have already endorsed the ‘Amman Message’? 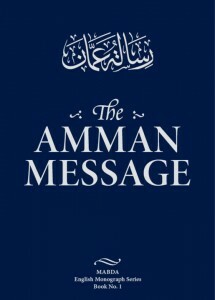 A: Based on the information provided in the ‘Amman Message’ website (http://ammanmessage.com/index.php?option=com_content&task=view&id=17&Itemid=31) as of June 1, 2015, there is no prominent Muslim entity yet from the Philippines that has endorsed the ‘Amman Message’.